The Samsung Galaxy S4 wins our award for Best Android Smartphone with a design that's attractive and comfortable, a slew of features, a great camera, and overall top-notch hardware. In addition to all that is good about Android 4.2 Jelly Bean, Samsung adds its own enhancements to the operating system of the GS4 via a skin (or interface) called TouchWiz. It makes Android a bit easier to use for newbies and, in some areas, makes the OS more efficient. The GS4 also benefits from a ton of pre-loaded apps and services. It's true that the dozens and dozens of Samsung extras and features and apps can get overwhelming. Thing is, everyone who owns a GS4 will find a use for at least a handful of them and most people will have one or two they can't live without. With few exceptions, every other feature can be turned off if you don't want it. The level of customization and choice is deep but not necessary, making the GS4 a very malleable phone. If you're the type of person who really dislikes interface skins and would rather have a phone loaded with Android the way Google intended it, you can choose the Google Edition Galaxy S4. It's identical to the "regular" GS4 hardware-wise, but doesn't have a skin, extra apps or most of the extra features Samsung highlights. This model is available directly from Google and is expensive ($649) because it's not offered through a carrier and not subsidized. One of the most impressive aspects of the GS4 is how slim and light it is, even with a substantial display. The 5-inch screen offers a good balance between size and holdability (if that’s a word) because it's relatively narrow; most people will be able to use the phone one-handed. Much has been made of the GS4's polycarbonate plastic body, particularly in relation to the HTC One's all-metal frame. The benefits of Samsung's approach are more practical than aesthetic. Thanks to the plastic back, owners can access the battery and a microSD card slot. With a smartphone that puts so much emphasis on taking pictures and media, the ability to add more storage is important. And while the GS4's battery life is decent at the outset, batteries have a tendency to lose their longevity over time. If that happens before two years is up, owners can replace the battery instead of being stuck with a phone that needs topping up all the time. Being a top of the line phone, the Galaxy S4 boasts top of the line specs, including a crisp and vivid 5-inch, 441ppi display, quad-core processor and 2GB of RAM for speed, 16GB - 32GB of internal storage, and the most recent version of Bluetooth, 4.0. The one place the GS4 could use substantial improvement is in the audio quality. The rear speaker is decent but not great, unlike the HTC One's front-facing stereo grills. The rear camera sports the trendiest number of megapixels: 13. The performance of the camera is more than hype. The GS4 benefits from a good sensor and great software in the camera app. Even when just taking normal shots, the results are crisp and detailed enough to print out. With the extra settings and features on board it's possible to create complex images without an extra photo editing program. The GS4 is available on all four major carriers—another big plus. Pricing varies by carrier with T-Mobile requiring the least amount of money up front ($149), followed by AT&T, Sprint, and Verizon Wireless ($199). All prices are on-contract or on a payment plan. 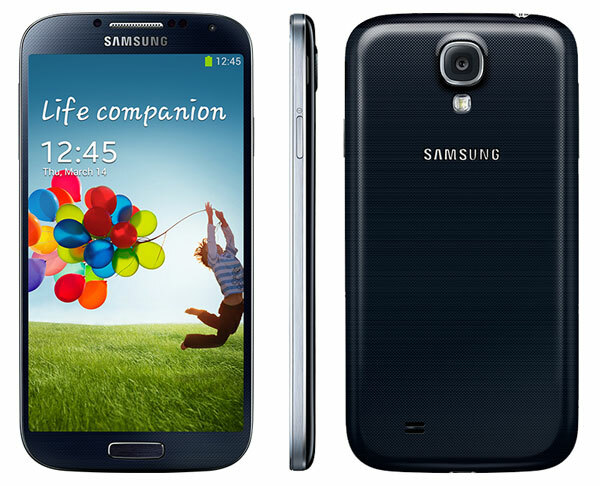 The Google Edition Galaxy S4 is $649, as mentioned, and is compatible with AT&T and T-Mobile's networks. Before you buy from the carriers, though, check the prices on Amazon Wireless. You can save up to $50, depending on the plan.